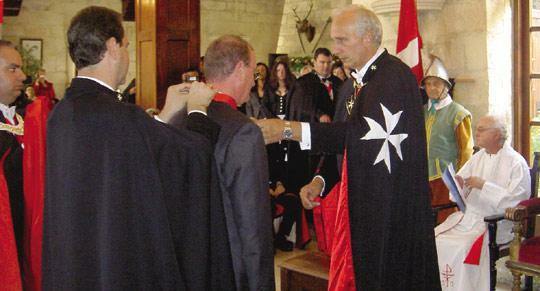 Last month, a solemn investiture was held at the International Diplomatic Headquarters of the Knights of Malta at Castello dei Baroni, Wardija, under the patronage of the Prince, Grand Master Baron Nicholas F.S. Papanicolaou, and Duke Adrian Busietta, Grand Master Emeritus. Knights and dames were welcomed by Mr Busietta and Marie Angelique Caruana at a lavish reception held in the palace's magnificent gardens. Special guests included Russian Ambassador Andrey E. Granavsky, the Grand Prior of Hungary, Chev. Arped de Bonta, the Grand Prior of Austria, Chev. Dr Wil Goodheer, the Grand Prior of Greece Chev. George C. Georgopoulos, the Grand Prior of Florida, Chev. Keith Carson, and the Grand Chancellor of Assisi, Chev. Prof. Georgio Cegnia.